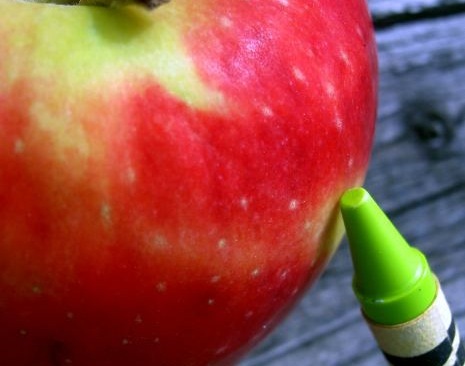 Mostly-red apple adjoined with green crayon (Courtesy Red Greenred Apple/Crayon Fruit/Art Initiative Foundation). A quotation by Bass Lake Elementary assistant vice-principal Juliana Van Clemens was incorrectly transcribed in a recent Beacon story about the retirement of a longtime school district employee. Van Clemens had quipped, during a lighthearted exchange, “I might retire someday myself,” not “I might fire somebody myself,” as was erroneously written. The Beacon regrets that the writer made the error, and the writer regrets it even more.